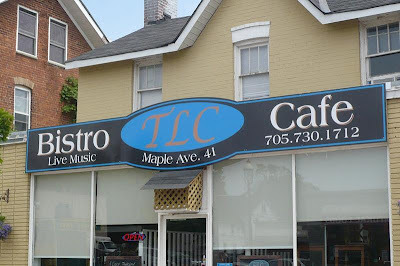 Last Sunday evening, an eclectic group of people gathered at the TLC Bistro and Café, 41 Maple Ave. in downtown Barrie. The Café was open for business. When we entered, one large table was celebrating someone’s birthday, while others came to have a quiet meal. After a time, Larry, the proprietor, went to the stage area, took up his guitar and sang a couple of his favorite Neil Young songs. Meanwhile people continued to gather. After a time, Pastor Matthew Swain took the microphone and welcomed everyone, announcing that it was time for “Steam” to begin. Over the next two hours, many people shared their talents and passion for God in celebration that I could only describe as worship. Several musicians had come prepared to play their own original music; some on guitar, one young lady on the keyboard, then a man using guitar and a harmonica. Two people shared a scripture and lead a discussion about it. Others shared a prayer, and a couple of people bore testimony of powerful experiences with the Divine. Of the twenty plus people who stayed for the evening, about 1/3 were members of Community of Christ, the sponsoring church. The rest were welcome guests including this time, all of the musicians. That mix is not what the church is used to in Canada, but then again, neither is Steam. At one point, I gave voice to some musing that had rolled across my mind; “I wonder if Jesus ever spent an evening like this in a café with a group of musicians and disciples,” to which someone replied, “I think he probably did.” It would be just like him, wouldn't it? One thing I know for certain is that the presence of the Holy Spirit was with us this Sunday night, sharing in the theme and Spirit of Love. As Larry would affirm at the end of the evening, “This was good tonight. Every song, every thing, meant something.” It was the perfect summary of an evening of tender loving care at the TLC café. i sooooooo wish i were closer!